We lived for a time in the heart of the Cambrian Mountains of Wales and this consequently meant our racing pigeons had to endure repeated attacks from Peregrines, Goshawks and Sparrowhawks. We hope the information contained below may give you an insight into our own experiences of suffering constant raptor attacks throughout the year. 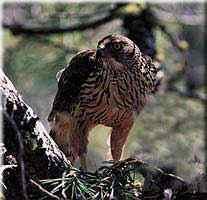 After nearly two years, all gay pieds, reds and any with white flights had been lost to the birds of prey. 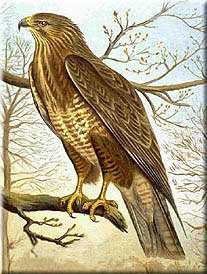 This was our most dangerous raptor and caused us to lose many pigeons; there were not many days when the Peregrine was not hunting for food in our locality. 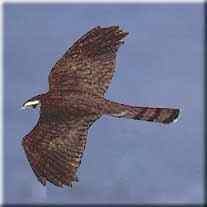 One interesting point was we never witnessed a chase by the Peregrine against our very dark chequers or all blacks when these colours were out exercising with pieds, blues or chequers. 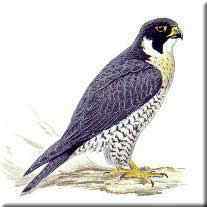 In most cases the Peregrine would miss catching his intended prey, especially with birds that had been bred there and also had age and experience on their side. However, the downside is that even when the Peregrine missed our pigeons, he managed to scare them into a frenzy of diving into the trees for cover and they would often seriously damage themselves when hitting the branches. We were unable to find any defense against this hawk. We tried all the many so-called popular deterrents and found none to work in the long term. 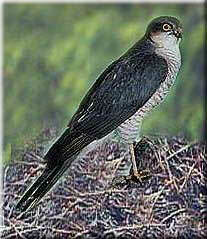 Another danger with the Sparrowhawk,he is not afraid to enter the loft. Because he hides near trees or tall hedges awaiting his chance to strike, the only remedy to eleviate some of the losses is to make sure your lofts are not located near these natural hiding places. this is no defence as he will then go into the trees and remorslessly chase them. 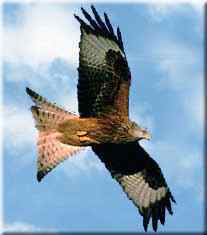 The Red Kite and Buzzard are no threat to your pigeons, your birds will rarely give them a second glance. 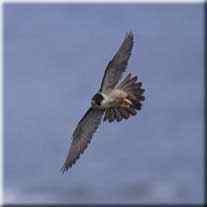 Both fly at great heights and may at times be mistaken for the Peregrine, but unlike the Peregrine, they glide on thermols for considerable periods. 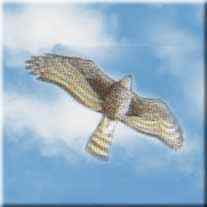 The picture below illustrates the unmistakable outline of the Red Kite and Buzzard.